We open today’s pulse-pounding episode with a long scene of two young women trying on dresses that they’re planning to wear to a costume party. You can tell that the show is running a little low on suspense right now, because Vicki says, “When you said her name, the strangest feeling came over me,” and then we’re supposed to be interested in learning more about that feeling. 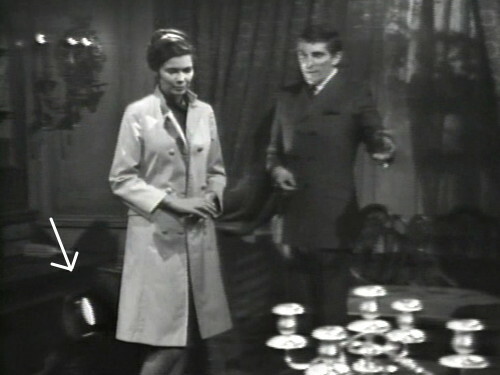 So far, the gold standard for a boring Dark Shadows conversation has been episode 233, when Vicki and Carolyn sat around in the drawing room for the whole episode, explaining to each other how they feel about a thunderstorm. This conversation doesn’t approach that level of pointless time-filling, but it’s in the same area. Carolyn: What kind of feeling? Vicki: A feeling… that I’d worn this dress before, and that I’d gone through a moment that I’d experienced before. Carolyn: That is strange. I’ll tell you something, Vicki — when I was trying on this dress, a chill went through me. Isn’t that gorgeous, though? “A chill!” That’s how you know you’re watching serious drama, when someone expresses that level of alarm about somebody else’s chill. Vicki: I’m going to be very proud that for at least one night, I’ll actually be a member of the Collins family. Carolyn: Vicki, you should be a member of the family. If anyone deserves to be a Collins… it’s you. Which is the kind of thing that makes you wonder about the scriptwriter’s commitment to theatrical realism. I’m not sure that a human being would ever talk that way, although I’ve been watching a lot of Dark Shadows lately, and my perceptions may be off. Meanwhile, Willie is preparing for the party at the Old House, as Barnabas paces around the room talking about how great it’s going to be. But this is Barnabas’ first party in almost two centuries, so he’s a little over-excited. He even says, “This will be the most important night of my life,” which is obviously not true. Dude… you rose from the dead. I think the prize for “most important night of my life” is pretty much taken. Barnabas and Vicki are both talking about this party like it’s the senior prom; it’s their whole world right now. They can’t think about anything but the big dance. There are at least two problems with that statement. Number one, they’re not your ancestors; they’re the Collins family ancestors. And number two: a brilliant idea? Really? Burke is usually pretty level-headed, but he’s getting into the spirit today too. Vicki says that she’s going to the party dressed as Josette, and then the whole show has to come to a screeching halt so Burke can have a feeling. Burke: It’s funny, but — something bothers me about this. I don’t know why. Maybe it dates back to that séance, when Josette Collins spoke through you. I know, the only thing I’m doing today is poking fun at the dialogue, but this episode is like 90% talking and 10% putting on dresses, so I don’t have a lot to work with. I’m just going to point out that “maybe it dates back to that séance” is an extremely Dark Shadows thing to say, and then we’ll keep moving. Next up, we’ve got a scene that I actually like a lot, because it’s got Willie in it, and he’s just on fire these days. I may be in the minority on this, but I think John Karlen is the best actor on the show right now, and every scene that he’s in is worth watching. As I’ve said before, Karlen adopts his own personal theatrical style for any given scene, usually Death of a Salesman or A Streetcar Named Desire. Today he’s doing Salesman, with a hint of George from Act 3 of Our Town. Vicki’s come over to ask Barnabas if Burke can come to the party. Willie opens the door, and it’s obvious that when he looks at her, all he can see is the horror that she doesn’t realize is about to be unleashed on her life. Vicki: Are you going to be there? Willie: Yeah, I’ll be around. Vicki: Are you going to wear a costume? Willie: I don’t know. Mr. Collins wants me to, but I feel a little funny about it. Vicki: Oh, you must. It’s going to be such fun. Willie: … You think so? Vicki: Yes, I do. You could do with some fun, Willie. You never smile. Do you know that? Willie: I haven’t got that much to smile about, that’s all. And he tries to put on a little forced smile, which dies before it reaches his eyes. 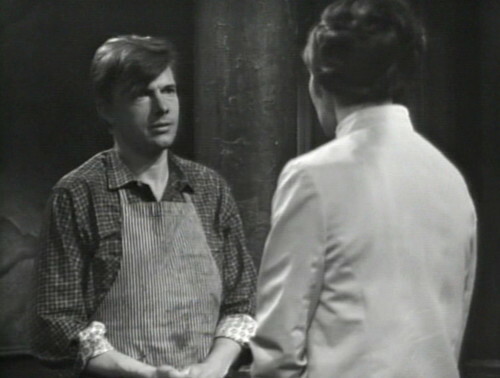 John Karlen’s the only member of the Dark Shadows cast to win a primetime Emmy Award, by the way. Okay, it was for Cagney and Lacey, but how many Emmy Awards have you won? There’s a slightly less subtle performance coming up. 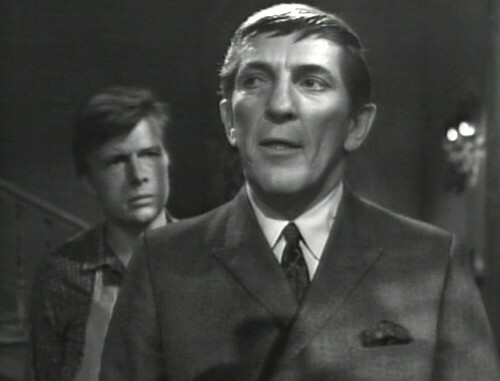 Vicki asks Barnabas if he can invite Burke to the costume party, and Barnabas puts on the frowniest possible expression. Although it makes sense that he’s put out by this request — the whole point of the party is to for Vicki to be seduced by Barnabas. She’s not supposed to bring her boring boyfriend along. 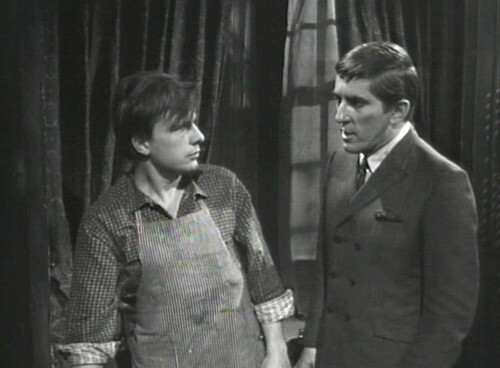 But then Barnabas gets an idea. 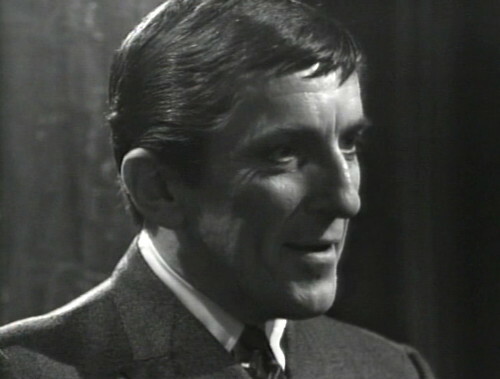 Barnabas: There is a role that Mr. Devlin could play. He could play a very important member of the family. Vicki: Jeremiah… wasn’t he the husband of Josette? Vicki leaves, and Barnabas takes a moment to gloat to Willie. Barnabas: Burke Devlin is coming as Jeremiah Collins. Oh, that doesn’t mean much to you, I realize, but to me — he was an object of hate. He was the worst enemy I had. If time had permitted, I would have destroyed him. Tomorrow night… I may well have that opportunity. So that’s fun, right? This was a super talky episode, but tomorrow, we’re having a party. And it will be the most important night of your life. When Barnabas and Vicki step away from the window, you can see a stage light in the corner. – In the real world, that comment would be an insult to Vicki. That she has finally reached their level of dysfunction. Ha, yeah. Carolyn says it as if being a Collins would be an honor, rather than a nightmarish curse. By the way, I am LOVING these. I’m also doing a post-Barnabas rewatch right now and am about 15 episodes behind you. Please keep it up. Your observations are killing me. Actually, Vicky is a Collins. Though it was strongly inferred, but never actually confirmed, in the early episodes of the show, Victoria Winters was indeed the illegitimate daughter of Elizabeth Collins Stoddard. The closest the makers of the show ever came to confirming this was the 2003 radio drama Return To Collinwood, which reunited the original TV series cast, written by the son of David Selby, Jamison Selby, where the will of the late Elizabeth Stoddard is read naming Victoria Winters as her actual daughter. This play was approved by Dan Curtis Productions. Say, isn’t it interesting that, in real life, the actor who played Quentin would have a son named Jamison? 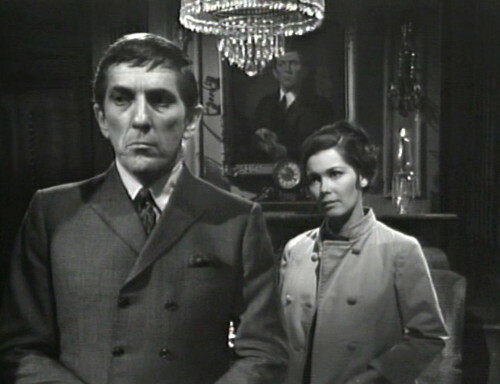 Also, and perhaps as a resolution on behalf of Dark Shadows fans, the two principal cast members have since gone on record to confirm this element of the story line. Which renders the “Barnabas loves Vicky” story line decidedly incestuous. just began watching this episode and it got me wondering – has anyone done a count on how many times vicki says, “i dont know” during the whole series? a monumental task, to be sure. its her tag phrase!!!! john karlen is awesome, i agree. I have to agree, Karlen is getting better and better. He seems very natural, and when he’s on, you can really feel the horror of the situation. Barnabas has too much of a combination of charismatic-and-crazy to make you feel that anything about the situation is actually horrifying. 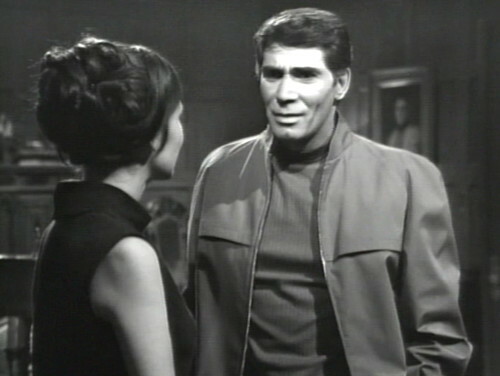 Nevertheless, I think Frid is doing a great job with a bizarre role — psychopathic vampire morphing into romantic hero while launching crazy schemes to recreate the past, seduce women and destroy his enemies by proxy. There’s a lot to juggle. And I have to say, when he first reacted to Vicki’s request to bring Burke, I felt his sadness loud and clear; his reaction didn’t seem truly theatrical til he got to the window. At first, he looked genuinely hurt. Another John Karlen fan here. Willie/Barnabas scenes are fantastic. But somehow, I’m good with these ladies trying on dresses and feeling vaguely nervous. I like that unexplained foreboding they constantly were beset by. Saw an interview with Karlen where he talked about how easy he had it re: line memorization compared to Frid due to the disparity in amount. I think he was able to show emotion so well because he was more confident in his lines. Poor Barnabas was always struggling because of the volume of lines he had to remember.